After the enormous success of 2003’s Pirats of the Caribbean: The Curse of the Black Pearl, I thought the floodgates would open and we’d get many more movies based on theme park attractions. Even though the Pirates sequels did well, neither Disney nor other studios showed much inclination to follow that path. Perhaps the commercial disappointment of 2003’s Haunted Mansion acted as a cautionary tale. Perhaps Disney figured Pirates was lightning in a bottle and not an easily repeated phenomenon, a notion supported by the box office mediocrity of 2015’s Tomorrowland. With a worldwide gross of $208 million, the movie barely earned more than its $190 budget. Those figures don’t support the notion that audiences crave additional films connected to Disney attractions. Though none of these flicks really does more than use the theme park elements as a loose springboard. As a child, Frank Walker (Thomas Robinson) showed remarkable scientific aptitude and a dream to make the world a better place. At the 1964 World’s Fair, a jetpack invention allows him to get to know famous scientist David Nix (Hugh Laurie) and Nix’s young friend Athena (Raffey Cassidy). Because Frank’s jetpack only partially works, Nix dismisses him. However, Athena takes a shine to the kid and gives him a pin that allows him to visit Tomorrowland, a futuristic domain with many wonders such as a robot who fixes the jetpack. From there we meet Casey Newton (Britt Robertson), another childhood scientific genius. She attempts to sabotage to demolition of Cape Canaveral’s launch pad, as she hopes this will give her laid-off NASA engineer father Eddie (Tim McGraw) continued work. Casey gets arrested during one of her late-night missions, and when someone bails her out, she discovers a mysterious pin among the belongings returned to her. When Casey touches this item, it suddenly transports her to the country outside of Tomorrowland – sort of. Though she can see the futuristic city, she remains physically bound by her location in Florida. Eventually Casey figures out how to fully visit Tomorrowland, and she gets to know an adult Frank Walker (George Clooney). Cynical Frank and optimistic Casey join forces to complete a mission to protect the future. Based on the talent involved, Tomorrowland looked like it would offer something special. Clooney doesn’t tend to attach himself to bad films, and screenwriter Damon Lindelof enjoys a pretty good track record as well. And then there’s Brad Bird. Tomorrowland represents only his fifth directorial effort, but each of the prior four films made a dent. Actually, 1999’s Iron Giant failed to muster much at the box office, but it got great reviews and still enjoys a strong reputation as a special movie. Bird’s next three films all struck financial and critical gold, though. From 2004’s Incredibles to 2007’s Ratatouille to 2011’s Mission: Impossible – Ghost Protocol, each Bird movie made more than $200 million in the US and a Rotten Tomatoes rating of at least 93 percent. That’s what we call “rarified air”, so four critically lauded films and three big box office hits led to high expectations for Tomorrowland. Too bad it became a letdown on all fronts. I don’t know if something went wrong behind the scenes with Tomorrowland, but I do know that the on-screen result never manages to catch fire. Part of the problem comes from the film’s exceedingly clunky set-up. In truth, the background to Tomorrowland shouldn’t be especially complicated, and a better-developed movie could sum up the premise in a few minutes. Unfortunately, Tomorrowland decides to take the long-winded approach. The movie uses a whole lot of real estate to introduce character/story areas, and this means the flick really drags during its first act. We need a tale that involves us from the get-go – or at least intrigues us – but Tomorrowland proves so sluggish that it threatens to lost the viewer out of the gate. Cripes, it takes 40 minutes before anyone bothers to explain the concept of “Tomorrowland”, and we almost make it to the one-hour mark to see Frank and Casey meet. If Tomorrowland was a six-hour miniseries, this slow pacing wouldn’t be a big deal, but in a 130-minute movie, the sluggishness becomes a massive problem. Even when the story finishes with all that explanation/exposition, Tomorrowland never manages to take flight. Part of the problem stems from its derivative nature. At times, it feels like Tomorrowland does little more than deliver a more warm and fuzzy version of Atlas Shrugged, though it also manages a hamfisted environmental message lifted from The Abyss. Oh, and the action borrows more than a little from Men in Black, so don’t expect a whole lot of originality on display. If Tomorrowland mustered some fun and/or excitement, I wouldn’t mind the movie’s derivative nature. Unfortunately, the movie feels so stale and slow that it can’t overcome its flaws. Despite all the time devoted to story/character beats, the movie feels thin and clumsy. It starts with little narrative depth and it stays that way. I remain at a loss to figure out what went wrong with Tomorrowland. The movie enjoys an awful lot of talent behind it, but the end product seems slow, sluggish and dull. Tomorrowland appears in an aspect ratio of approximately 2.20:1 on this Blu-ray Disc. This became a satisfying image. From start to finish, sharpness looked good. Virtually no softness materialized, so the film looked concise and well-defined. No issues with jagged edges or moiré effects occurred, and edge enhancement was absent. I also failed to detect any source flaws. As for the film’s DTS-HD MA 7.1 soundtrack, it offered a dynamic experience. With a variety of action and ambient elements, the audio brought the events to life in fine fashion. As we shift to the disc’s extras, we find some featurettes. Remembering the Future goes for seven minutes, nine seconds and presents notes from wroter/director Brad Bird, writer/producer Damon Lindelof, and actors George Clooney and Raffey Cassidy. “Future” looks at inspirations/influences for the movie as well as themes. It occasionally feels like a promo piece for NASA, but it offers a decent look at the filmmakers’ perspectives. 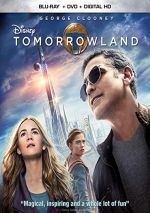 During the seven-minute, 27-second Casting Tomorrowland, we hear from Bird, Lindelof, Clooney, Cassidy, producer Jeffrey Chernov, supervising stunt coordinator Robert Alonzo, and actors Hugh Laurie, Thomas Robinson and Britt Robertson. As expected, the show looks at cast, characters and performances. Don’t expect much, but we find a fair overview of some acting-related areas. Music comes to the fore in A Great Big Beautiful Scoring Session. This featurette runs six minutes, three seconds and delivers info from composer Michael Giacchino. We get some basics about the movie’s score, but like the other programs, “Session” remains fairly average at best. The World of Tomorrow Science Hour goes for five minutes, eight seconds. It purports to offer outtakes from a proposed TV show with scientist David Nix. Of course, anyone who already watched Tomorrowland know that “Nix” is the character played by Hugh Laurie, so this segment brings us segments from a nonexistent program. It’s pretty entertaining. Next we get an animated short entitled The Origins of Plus Ultra. It lasts three minutes, 26 seconds and provides background for one of Tomorrowland’s concepts. The cartoon adds a little information for the viewer. Under Brad Bird Production Diaries, we find four minutes, 34 seconds of footage. These follow Bird on the set and give us a little behind the scenes material. The “Diaries” are way too short, but they’re enjoyable, even if some of the material repeats from “Remembering the Future”. A cute addition, we locate a “Blast from the Past” Commercial. The 41-second clip shows a fake promo for the shop featured in the film. It’s amusing. Six Deleted Scenes take up a total of 23 minutes, 28 seconds. (That total includes introductions from Bird.) These tend to add character exposition, largely related to Casey’s family, and we get a bit more background about plot elements as well. Some interesting pieces emerge, and Bird gives us good info about them. The disc opens with ads for Inside Out and Star Wars: The Force Awakens. Sneak Peeks adds promos for Disney Parks and KC Undercover. No trailer for Cinderella appears here. A second disc provides a DVD Copy of Tomorrowland. It includes one “Production Diary” and the “Blast from the Past commercial” but lacks the other extras. With a ton of talent behind and in front of the camera, Tomorrowland should’ve been a great sci-fi/action film. Instead, it winds up as a bland, slow tale without much originality or excitement on display. The Blu-ray offers excellent picture and audio but it lacks substantial supplements. Chalk up Tomorrowland as a major misfire and disappointment.